FC Barcelona Regal took the showdown between undefeated teams in Group D by downing Besiktas JK Istanbul 72-60 at home on Thursday. Barcelona is now tied with CSKA for first place at 3-0, with Besiktas right behind at 2-1. Nate Jawai scored 14 points and grabbed 8 rebounds to lead the winners, while Ante Tomic, Pete Mickeal and Marcelinho Huertas added 11 points apiece. 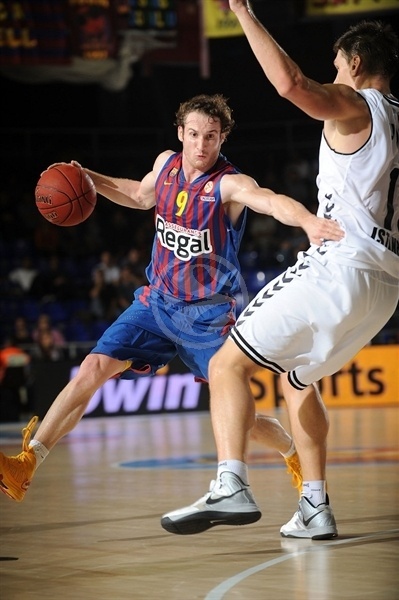 Huertas and Erazem Lorbek shined early to give Barcelona a 16-7 lead. An outstanding Curtis Jerrells brought Besiktas within 20-18 after 10 minutes. A tip-in by Baris Hersek completed Besiktas' comeback, 24-26. 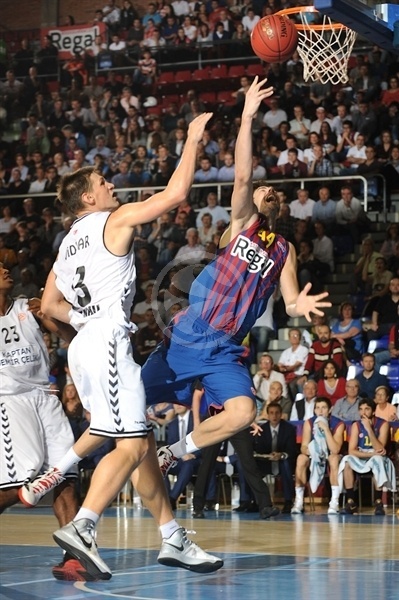 Sarunas Jasikevicius rescued Barcelona and a jumper by C.J. Wallace gave the hosts a 36-34 halftime edge. An 8-0 run that Tomic capped with a free throw made it a double-digit game, 52-42. Besiktas managed to get within 62-57 with three minutes to go but Jawai and Huertas were too strong in crunch time and kept Barcelona out of trouble until the final buzzer. Jerrells paced Besiktas with 18 points and Damir Markota added 10 in defeat. Pete Mickeal got Barcelona going with a big basket in the low post - and the free throw that came with it. Besiktas struggled to score in the opening two minutes until Jerrells struck from downtown. Tomic split free throws and Erazem Lorbek sank a jump hook for a 6-3 Barcelona lead. Tomic kept pacing the hosts with a tip-in and Lorbek added a put-back layup to boost the hosts' lead to 10-3. Gasper Vidmar hit an off-balance shot, which Jawai matched with a put-back slam. Jerrells hit free throws, but Marcelinho stepped up with back-to-back floating jumpers, good for a 16-7 Barcelona margin. 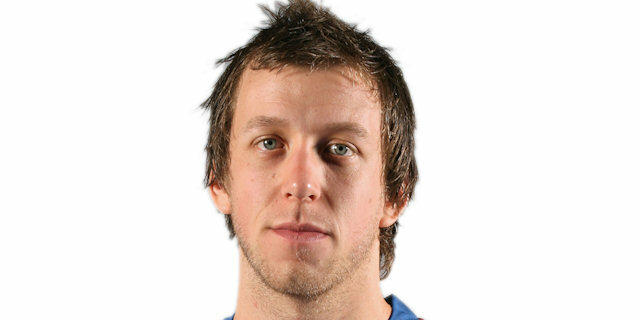 Patrick Christopher rescued Besiktas with a fallaway jumper that Joe Ingles copied in the other end. Jerrells found space for an uncontested layup and a three-pointer by Christopher brought the guests closer, 19-14. Vidmar scored down low and free throws by Jerrells kept Besiktas within 20-18 after 10 minutes. Vidmar shined with a backdoor layup early in the second quarter, as Barcelona struggled to score until Jawai hit a jump hook. 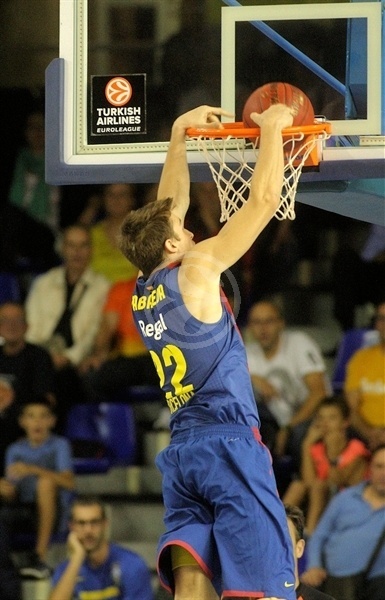 Tomic added a close basket to give Barcelona some fresh air at 24-20. Vidmar stayed on fire with a power layup as Barcelona tried to improve its ball circulation by bringing Sarunas Jasikevicius off the bench. Cehver Ozer made free throws and Baris Hersek took over with a tip-in to complete the guests' comeback, 24-26. Mickeal scored in the paint, but Hersek erased that with a baseline jumper. Jasikevicius buried a mid-range shot and follow that with a rainbow jumper to put his team back ahead, 30-28. Christopher shined with a high-flying put-back layup and then matched Jawai's jump hook with a backdoor basket for a 32-32 tie. Ingles fed Xabi Rabaseda for an alley-oop slam but Serhat Cetin answered with a long jumper for a 34-34 tie. A jumper by C.J. Wallace restored a 36-34 Barcelona lead at the break. Barcelona improved its defense after the break and free throws by Huertas gave his team a 38-34 lead. Randal Falker stepped up with a power basket, but Jawai answered with a jump hook at the other end. Damir Markota made foul shots - his first points of the night – but Lorbek beat the buzzer with a wild baseline jumper. Rabaseda sent the crowd to their feet with a one-handed alleyoop dunk, which caused Besiktas to call timeout at 44-38. Ozer tried to change things with a put-back basket and a driving layup by Jerrells brought the guests as close as 44-42. 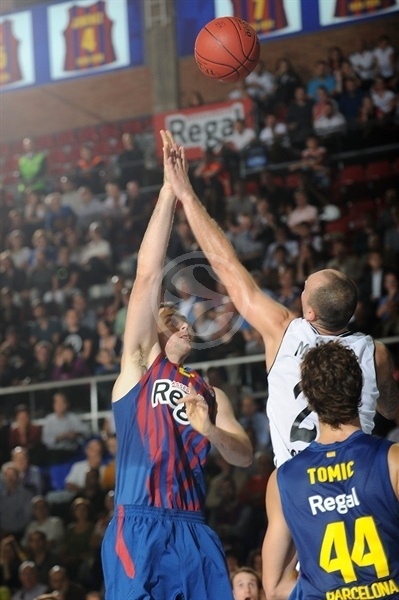 Huertas gave Barcelona some fresh air with a three-pointer and Tomic added a layup for a 49-42 score. Ingles and Tomic capped an 8-0 run with free throws to make it a double-digit game, 52-42. Jerrells scored in penetration and soon added foul shots to get Besiktas within 53-46 after three quarters. Both teams struggled to score for nearly two minutes until Jerrells shined with another driving layup. Wallace immediately answered with an off-balance jumper and Tomic added a layup in transition to keep Barcelona out of trouble at 57-48. Ozer struck from downtown but once again Wallace sank a catch-and-shoot jumper. Besiktas tried twin point guards with Jerrells and Tutku Acik together on court. 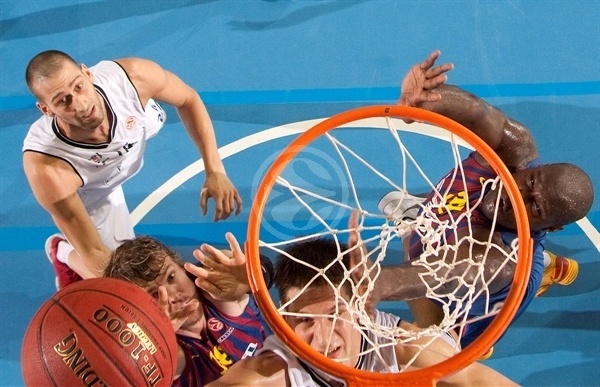 Markota beat the shot clock with a corner triple, but Jawai gave Barcelona a 60-54 edge with over four minutes to go. Barcelona improved its defense off a timeout and Jawai took over with a big dunk. Besiktas struggled to find open shots until Markota hit another triple for a 62-57 score with three minutes to go. Huertas scored in penetration and a backdoor layup by Jawai sealed the outcome, 64-57, with 2:08 left. 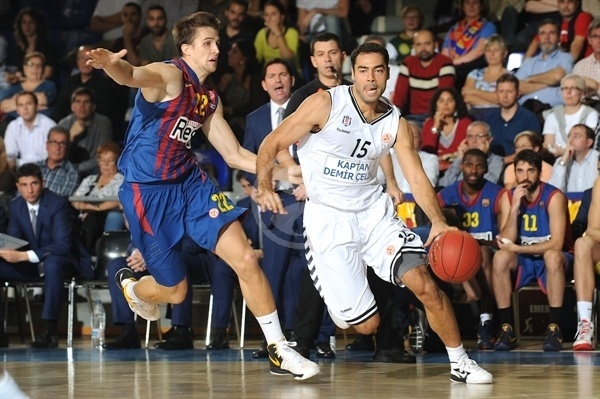 Besiktas called timeout and never gave up, but Barcelona cruised to an important win. "We are happy with this third regular season win, especially against an opponent that arrived here with spectacular numbers. They managed to get two big wins against Brose Baskets and Partizan. It is a tough to beat team with a slow tempo and good ball circulation. They controlled the game rhythm in the first half despite our good start. We lost our lead by making three consecutive mistakes. We were much better at both ends in the second half and managed to get an important win. We have started to play better defense and have to take advantage of our steals to run the floor a little bit. We made 4 turnovers in the first half, but 8 after the break. 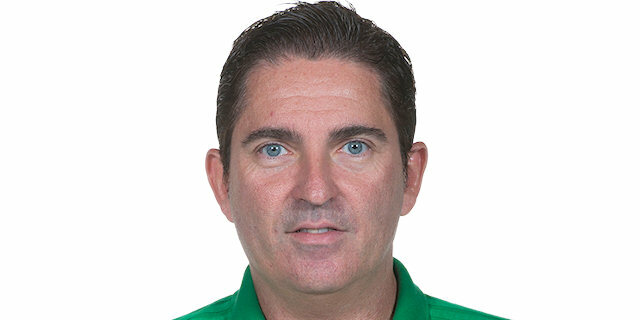 It is true that we had many steals, but that did not lead to many fast breaks. We passed the ball well and took 9 three-point shots, most of them open, that did not fall in. They were good shots, some beating the shot clock. We also made 62% of our two-pointers despite missing three or four easy shots. 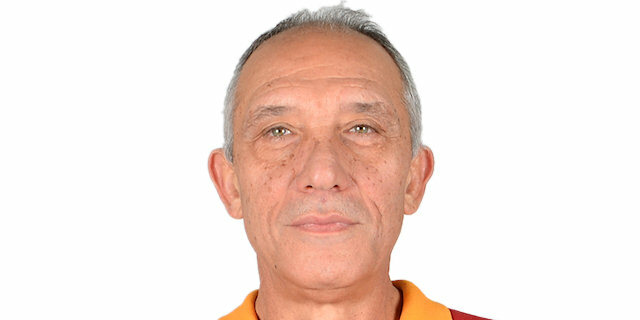 We have also found the way to be more stable in terms of fouls committed." "I think we played a little bit worse in the third quarter. We lost control of the game, couldn't run our offense, played more individual and we lost the game because of that. At this level, turnovers hurt us a lot. We made 2 or 3 easy turnovers in the third quarter and you cannot have that against a team like Barcelona. We have a new team that is trying to play with organization that at times is missing. We are searching for a solution. If we had played a little bit smarter, I think we could have had a big chance to win this game. We have seen the scores Barcelona had in the last three games, allowing 49 points against Lietuvos Rytas and 60 against Brose Baskets. Barcelona has a good defense and we knew that. They have a lot of players that were together last year and that gives them a core and defensive spirit. That is not easy to beat, especially if you score 12 points in the third quarter. They pushed us to make many turnovers." "They are a great team. They had two tough games that they won before this. I think our defense was pretty good and we shot the ball better than we have in previous games. Our defense is good; it’s what’s going to win us games. It was good to finish out a game with good defense for most of the game. We’re playing some okay basketball and getting better every week. " "When you have a team like [Barcelona], as well as they execute, it’s tough. They force turnovers and capitalize on the turnovers. Coach emphasized taking each possession and cherishing it. We had a few slip ups and as I said earlier, they took advantage of them. One thing coach also emphasizes is turning the page. We’ll look at the film from the game, learn from our mistakes and move forward."